LED Downlight is dimmable and available in 2-, 3- and 4-inch apertures. 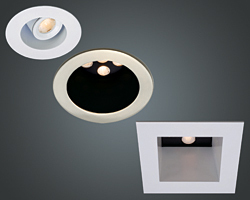 LEDme Recessed Downlights feature open or adjustable round and square trim styles. The adjustable fixtures offer a 40-degree vertical tilt and 350-degree horizontal rotation. All 2-inch units distribute light at a 24-degree beam angle and can be dimmed from 100 to 15 percent. All 3-inch and 4-inch units can be dimmed from 100 to one percent.